The McGillicuddy Humanities Center is proud to announce the launch of our brand new Humanities Digital Badge. 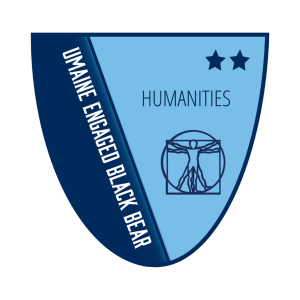 Center Director Margo Lukens worked with students to design this new Humanities Badge as part of the Engaged Black Bear Initiative. The badge encourages three levels of engagement with the humanities outside the classroom: participation, sustained involvement, and leadership. Not only does the badge give you an incentive to delve deeper into the humanities than you might have otherwise or capture the engagement you are already doing, but it’s a smart pre-professional activity. A badge can give competitive edge when seeking internship, employment, and other professional opportunities. In today’s job marketplace, many employers use algorithms to filter potential employees. A badge can make your resume stand out and help you passed that first cut. Digital badges enhance professional social media sites when shared/embedded on LinkedIn, Facebook, Twitter, and digital resumes. 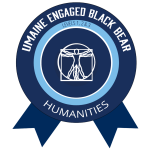 A UMaine-verified evidence-based record of engagement experiences outside of the classroom setting, not found on transcripts. For more information, contact Margo Lukens. This badge is issued in recognition of the your participation in three distinct humanities events on campus or in the community. By participating in these events you start to build relationships that enable you to identify ways to enhance your engagement in and understanding of the humanities. 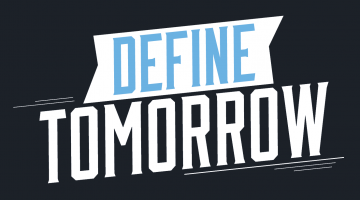 Attend three approved humanities events listed on the MHC calendar or the SPA calendar, or by attending UMaine Modern Language and Classic‘s language tables. Feel free to reach out to Margo if you have an alternative event/activity in mind to see if it qualifies. Provide one reflection as evidence for each event attended using this Google form or the embedded form the bottom of this section. For each approved humanities event attended, you must provide a reflection as evidence. You can do this individually after each event or all at once after you have attended all three. Evidence must be submitted to Director Margo Lukens. 1) Why did you choose this particular event? 2) What did the experience of being an audience member teach you? 3) How did the event match or challenge your expectations? Take a picture to document the event and post it on Instagram with a 50-160 word reflection on what you learned by attending. Tag the MHC: @mcgillicuddyhumanitiescenter. A brief reflection (200-words) on how your own ideas or beliefs about human culture were engaged, confirmed, or challenged by the event. *Or another form of reflection, pre-approved by Margo. A reflection must be filled out for each event, but can be done either after each event or all at once after you've attended three events. You can submit your reflections in one of two ways: Option 1) upload your reflection or a screenshot of your Insta-essay OR Option 2) paste in/write directly into the text box. You can upload your three reflections here or you can do Option 2 below and write/paste in your reflections for each event. Write/paste in your reflection for Event 1. Write/paste in your reflection for Event 2. Write/paste in your reflection for Event 3. Add a brief “About Me” and a professional-looking headshot to your Credly account. Actively engage in at least three humanities learning experiences beyond the classroom, such as participating in humanities clubs and organizations or applied learning opportunities (see below) on campus or in the community. Reflect on your experiences and provide appropriate evidence, such as images of grant applications, letters from organization leaders, or signed statements about volunteer work along with your written or recorded reflections. Use form at the bottom of the section to submit your evidence. This is not a finite list, please contact Margo Lukens if you would like to propose an alternative participation opportunity. Any of the SPA ensembles or shows. The Humanities Student Task Force was a group of undergraduate students who worked with Director Jennifer Moxley during the 2016-2017 school year to design the criteria for the Humanities Badge. Learn more about some of the members of the task force below.